Migrating gray whales pass San Diego’s coastline. Photo by Elizabeth Argyle. It’s February and whale watching in San Diego is still in full swing. 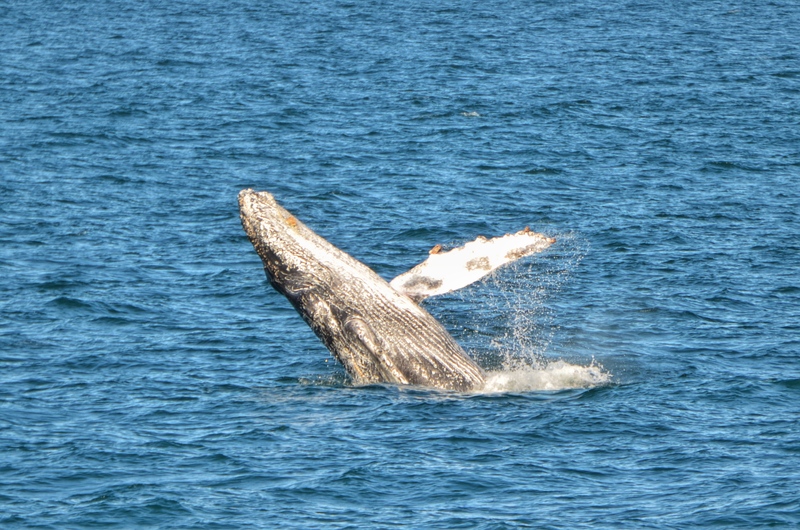 We’re nearly halfway through the season, and so far, passengers aboard the Flagship Cruises and Events’ vessel Marietta have seen more than 300 gray whales! In late December, when our gray whale watching season begins, we see southbound gray whales making their way down to Mexico. That all changed last week when we had our first glimpses of northbound gray whales. After spending time in the calm lagoons of Baja California, the grays begin to head back north, typically around February, so they are right on schedule. 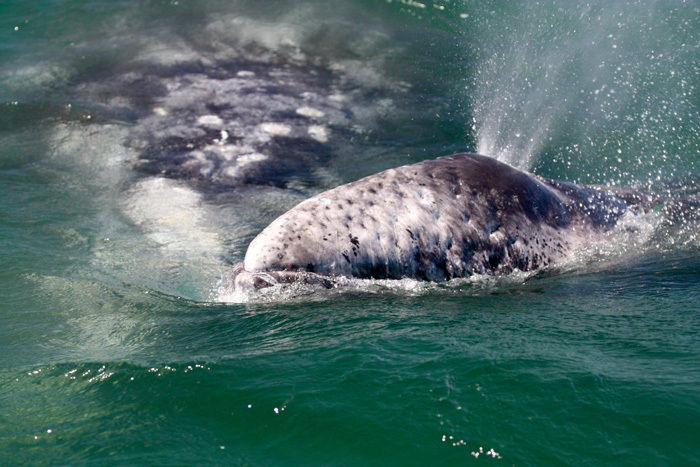 Gray whales migrate along our coast every year to breed and give birth in any of the three lagoons in Baja California. The lagoon waters are warm, salty, and predator free — perfect for gray whales, especially their calves. Juvenile whales are extremely vulnerable, especially as newborns. Mothers spend time nursing and the calves grow stronger; single adults mate and juveniles frolic. A gray whale calf and its mother swim close together in a Baja California lagoon. Photo by Caitlin Scully. The first northbound migrators are usually the young juveniles, and that has primarily been the case on the Marietta. These immature whales make the trip to Baja for practice; they will definitely need to know the way when it comes time for them to reproduce. Anxious to return to familiar feeding grounds, the youngsters lead and are soon followed by adult males and newly pregnant females and eventually the mothers and calves. It’s definitely an exciting trip in the Pacific Ocean. If you haven’t seen these amazing cetaceans, now is the time! Marine life abounds and you can’t beat the fabulous, sunny skies of San Diego! 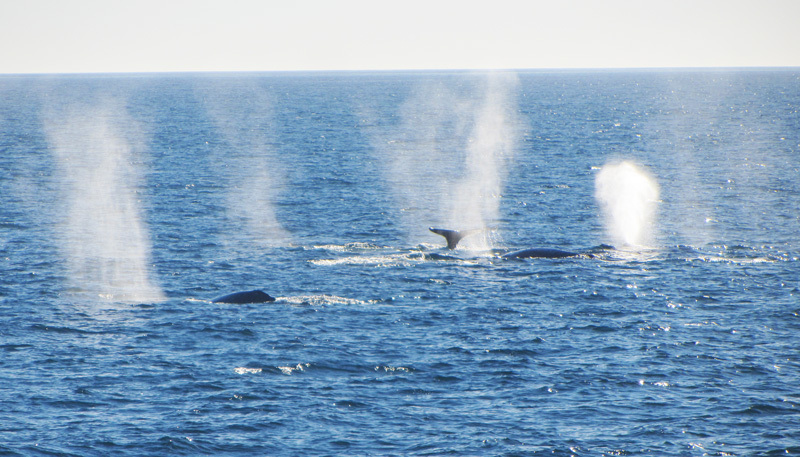 Daily whale watching cruises continue through April 14. Cruises leave at 9:45 a.m. and 1:30 p.m. from Flagship Cruises & Events at 990 N. Harbor Drive in downtown San Diego. For more information and to download a $5-off whale watching coupon, visit the Birch Aquarium Whale Watching page. Last year you offered a 4 day whale watch cruise to the Baja around March 13th. Why did you cancel this? Do you have anything comparable at that time? Unfortunately, it was no longer feasible for us to offer more than one Baja tour this year. Our traditional San Diego whale watching, however, continues through April 14. We are looking into ways to expand our whale-watching activities in the future. Stay tuned! This is my picture of a baby gray in Baja from 2009! I have been on extended whale watching trips down in the Baja two times. Absolutely loved it. Would like to do it for a group next February. Any chance you will be doing it again? We may do the trip again next year in Feb/March. So check back with us in December or January! Thanks for the Info, but I need to know much sooner as I would like to have a group[ and it takes a while to get them all together. How many do you need for a trip and what is the capacity? Could you please get in touch with me soon to give me more information.